Be the first to share your favorite memory, photo or story of Cera. This memorial page is dedicated for family, friends and future generations to celebrate the life of their loved one. 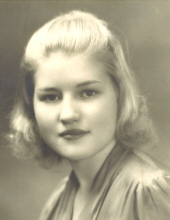 Cera A. Laughlin, 97, of Waterloo, died Sunday, January 13, at Ravenwood Specialty Care. She was born January 20, 1921 in Fellingsboro, Sweden, daughter of Emil and Victoria Celinder Johanssen. She married Loren L. Laughlin on February 17, 1940, he died March 13, 2000. Cera graduated from East High School in 1939. She was a world class diver on the East High Shark Swim Team. She was employed as a cook at Pinky’s Tap for many years. Cera and family came to America on a ship being processed through Ellis Island at the age of two. They became residents of Waterloo settling by cousins in the area. She was an active member at Good Shepherd Lutheran Church. She had many talents; she played the Mandolin guitar and banjo, enjoyed crocheting, painting ceramics, and dancing, tap and ballroom. Cera loved flowers but most of all she loved spending time with her family. Survivors include: four sons; Victor (Carolee) Laughlin of Jesup, Robert, Gene, and Donald Laughlin all of Waterloo; a daughter, Dawn Laughlin of Waterloo; a sister, Gloria Hinton of Ark. ; 19 grandchildren, 34 great grandchildren and 23 great-great grandchildren. Preceded in death by: her parents; a brother, Emil F. Johanssen; a son, William J. Laughlin; a granddaughter, Debra O’Hara; a great grandson, Jordan T. Laughlin; and brother-in-law, Richard Hinton. A Celebration of Life will be Friday from 5-8pm with inurnment at a later date. Memorials made be made to the Cera A Laughlin account at Veridian Credit Union. To send flowers or a remembrance gift to the family of Cera Adela Laughlin, please visit our Tribute Store. "Email Address" would like to share the life celebration of Cera Adela Laughlin. Click on the "link" to go to share a favorite memory or leave a condolence message for the family.